Israel and Islamist militant group Hamas have agreed to a 72-hour ceasefire in their conflict in the Gaza Strip starting on Friday, U.S. Secretary of State John Kerry and U.N. Secretary-General Ban Ki-moon said on Thursday. The ceasefire will begin at 8 a.m. local time (0500 GMT) on Aug. 1, they said in a joint statement. The statement said “forces on the ground will remain in place” during the truce, implying that Israeli ground forces will not withdraw. Speaking from New Delhi, Kerry said neither side will advance militarily from their current positions, but that Israel will continue to destroy tunnels Hamas has used to smuggle weapons and fighters into Israel. Kerry calls the next 72 hours a precious time for all parties to address the issues that brought on the last three weeks of violence. He says the people of Gaza deserve to live in safety and dignity, while Israel's security concerns need to be met. Hamas, the dominant militant group in the Gaza Strip, said it would abide by the ceasefire. “Acknowledging a call by the United Nations and in consideration of the situation of our people, resistance factions agreed to a 72-hour humanitarian and mutual calm that begins at 8 a.m (0500 GMT) on Friday as long as the other side abides by it,” Hamas spokesman Sami Abu Zuhri told Reuters. “All the Palestinian factions are united behind the issue in this regard,” he said. Israeli and Palestinian delegations will immediately travel to Cairo for negotiations with the Egyptian government to reach a durable ceasefire, the statement said. Fighting continued, however, overnight. Hamas said it fired rockets at Israel, setting off air raid sirens in the area of Tel Aviv. Residents of Gaza reported further Israeli shelling. Earlier, Israeli Prime Minister Benjamin Netanyahu had said that Israel was determined, regardless of cease-fire efforts, to finish the destruction of tunnels that Palestinian militants have built under the Gaza-Israel border. Major General Sami Turgeman, chief of Israeli forces in Gaza, said they were “but a few days away from destroying all the attack tunnels.” They have shut down at least 30 to date. Earlier Thursday, Israel's military called up an additional 16,000 additional reservists, taking their total to 86,000, as military operations in the Gaza Strip continue, an army spokeswoman said, according to the French news agency AFP. Israel's security cabinet on Wednesday unanimously decided to pursue attacks against Hamas "terrorist targets" and other operations to destroy a network of tunnels used by the Islamist movement between Gaza and Israel, public radio said. While Netanyahu's security cabinet approved continuing the assault, Israel also sent a delegation to Egypt, which has been trying, with Washington's blessing, to broker a cease-fire. Meanwhile, the death toll has soared. Gaza officials said at least 1,400 Palestinians, most of them civilians, have now been killed in the battered enclave. Israel has lost 56 soldiers to Gaza clashes and three civilians to Palestinian shelling. Overnight, several large explosions lit up the sky as Israel continued its airstrikes and heavy shelling. Early Thursday, plumes of smoke could be seen rising above Gaza City. Later Thursday morning, a lull in Israel's offensive encouraged Gaza residents to go out and stock up on supplies. VOA Jerusalem bureau chief Scott Bobb reported seeing long lines outside bakeries and in vegetable markets. Many Palestinians find it difficult to keep perishables because electricity is scarce, especially after an Israeli tank atttack shut down Gaza's main power plant Tuesday, Bobb said. And many are trying to feed relatives displaced by the fighting elsewhere. The food supply has not been seriously disrupted, with new items coming through the crossing at Khan Younis, a town on the Gaza Strip's southern edge. But food prices have climbed substantially since fighting began, Bobb said. Mosques are redistributing food donated by residents, filling in where U.N. supplies aren't available. The surging death toll has provoked international alarm. Displaced Palestinian children collect water at the Abu Hussein U.N. school in Jebaliya refugee camp, northern Gaza Strip, on July 30, 2014. It had been hit by artillery shells earlier in the day. On Thursday, a day after at least 15 Palestinians were killed in the predawn shelling of a U.N.-run school sheltering evacuees in Gaza, the United Nations' top human rights official accused Israel of defying international law by conducting its deadly offensive and of possibly commiting war crimes. "We cannot allow impunity, we cannot allow this lack of accountability to go on," said Navi Pillay, the U.N. high commissioner for human rights, Reuters reported. She held Hamas culpable, too, saying the militant group's indiscriminate rocket fire into Israel violated international humanitarian law, Reuters said. Pillay also scolded the United States, Israel's closest ally, for not doing "much more to stop the killing, to bring the parties to the negotiating table." 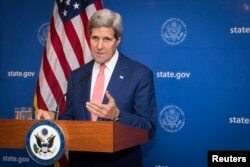 U.S. Secretary of State, John Kerry, announces a 72-hour humanitarian ceasefire between Israel and Hamas, in New Delhi, India, Aug. 1, 2014. U.S. Secretary of State John Kerry, in India Thursday for a meeting with its foreign minister, Sushma Swaraj, said he had continued to work toward a cease-fire. A cease-fire "at some point is essential," said Kerry, who acknowledged working diplomatic phone lines while enroute. "The United States remains hopeful that it is achievable, and the sooner the better." The Obama administration had condemned the school shelling Wednesday. Spokeswoman Bernadette Meehan said the U.S. is extremely concerned that thousands of Palestinian driven from their homes cannot find safety in U.N.-designated shelters. She also condemned those who hide weapons in those shelters. Israel said its forces were attacked by guerrillas near the school, in northern Jabalya, and had fired back. It did not immediately comment on another incident, in nearby Shejaia, in which Palestinian officials said 17 people were killed by Israeli shelling near a produce market. “Such a massacre requires an earthquake-like response,” said Hamas spokesman Fawzi Barhoum, whose group has kept up dozens of daily rocket launches deep into Israel. The U.S. on Wednesday announced the sale of weapons to Israel, including 120mm tank rounds and 40 mm illumination rounds. The Israelis have kept casualties from the salvoes low with nine Iron Dome interceptor batteries and air-raid sirens that send people to shelters. As the violence continued Thursday, the United Nations reported about 15,000 more Palestinians seeking refuge in its shelters in Gaza. That brought the total number to about 220,000, which is four times what the U.N. said it expected from the crisis. Approximately 1.8 million Palestinians live in Gaza. The tiny territory's infrastructure is in ruins, with power and water outages. Both Israel and Hamas have voiced openness to a truce, but their terms diverge dramatically. Israel wants Gaza stripped of infiltration tunnels and rocket stocks. Hamas rules that out. It seeks an end to a crippling Gaza blockade enforced by Israel and Egypt, which view the Palestinian Islamists as a security threat. The negotiations are further complicated by the fact that Israel and the United States shun Hamas as a terrorist group, while the go-betweens - Egypt, Qatar and Turkey - disagree on Gaza policy. In the absence of a deal, Israel has ordered its ground forces to focus on locating and destroying a warren of tunnels with which Hamas has menaced its southern towns and army bases. Three Israeli soldiers were killed on Wednesday by a booby trap detonated as they uncovered a tunnel shaft, the army said. Military losses are more than five times those from the last Gaza ground war, in 2008-2009, but Israeli opinion polls show strong public support for fighting on until Hamas is quelled. Netanyahu faces intense pressure from abroad to stand down, however. The United States and the U.N. Security Council have urged an immediate, unconditional cease-fire by both sides in Gaza to allow in humanitarian relief and for further talks on a more durable cessation of hostilities. Separately, the Pentagon said it had allowed Israel to stock up on grenades and mortar rounds from a U.S. munitions store located in Israel as part of bilateral emergency preparedness arrangement. VOA's Scott Bobb contributed to this report from Gaza City. Additional information was provided by Reuters, AFP and AP.